Road trip! 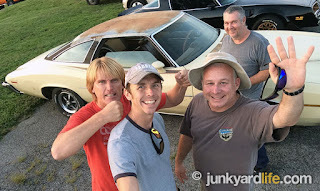 A journey to the 43rd Annual POCI (Pontiac Oakland Club International) Convention in Louisville, Kentucky, along with a detour to Indianapolis, turned into the ultimate Junkyard Life adventure! I didn’t really think that all of the stars would line up in our favor, but they did, somehow. 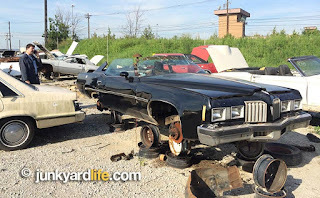 The Junkyard Life crew planned on taking two cars to the huge Pontiac car show, along with a big truck to haul back any greasy goodies that we might find at swap meets or junkyards in our path. 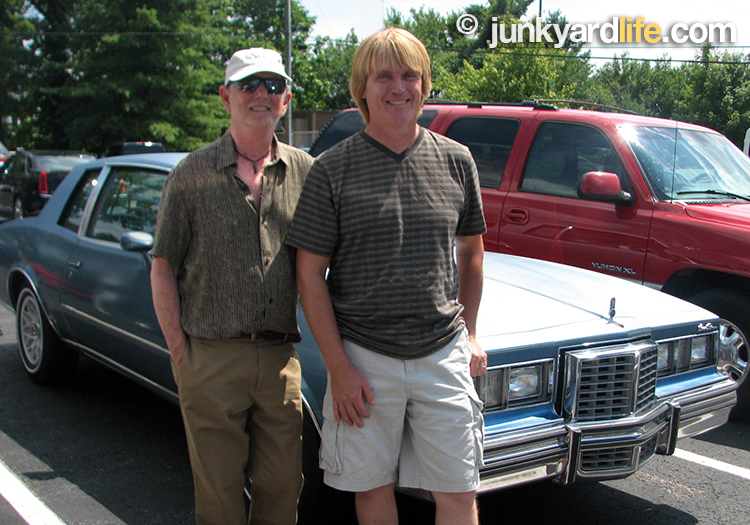 Anthony Powell prepared his 1979 Pontiac Grand Prix SJ, as I worked on my Colonnade-era Grand Prix, for what turned out to be a 1,000-mile round trip from Alabama to Indy via Louisville. We jammed for weeks on our Pontiacs to meet the July deadline. Working until the witching hour of the trip. Ron Kidd inspects a leaking fuel tank on his 1973 Pontiac Grand Prix – at 3 a.m. on departure day. Day one, at zero dark thirty, started a little sad. Valencia, my 1973 Grand Prix SJ, decided that she didn’t want to go. 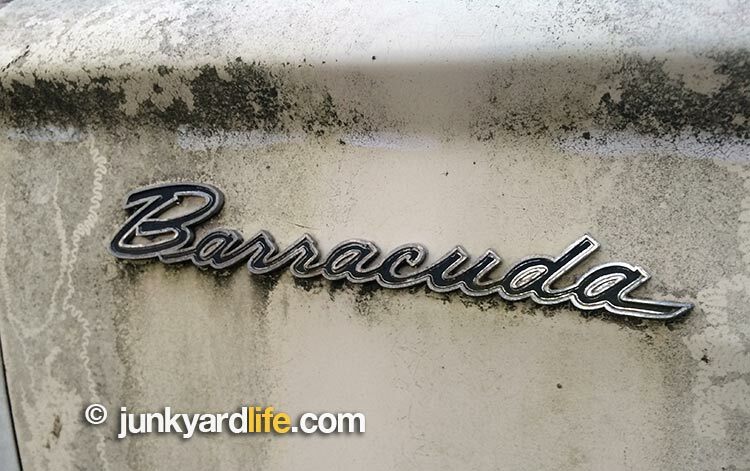 Unfortunately, she has a leaking fuel tank that acts out when the tank is completely full. I learned this at 3 a.m. with a full tank of gas, at the exact time that we were scheduled to leave. We opted to not risk driving into unthinkable possibilities. The SJ Hindenburg was grounded. 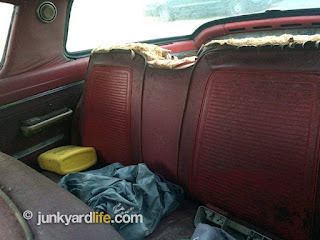 I alternated riding in the shotgun seat of Jody’s truck and Anthony’s GP. A rocky start, but later in the trip, the bad luck turned around. 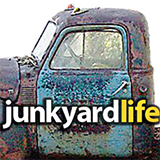 A week prior to the POCI trip, our phone rings and it is Junkyard Life affiliate and long-separated brother, Scott Scheel. Scott, president of the Indy Firebird club and coordinator of numerous Pontiac events, offers us the chance of a lifetime. 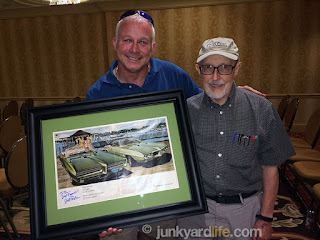 We were invited to have lunch with legendary Pontiac designer Bill Porter before his POCI presentation. Us? With Bill Porter? 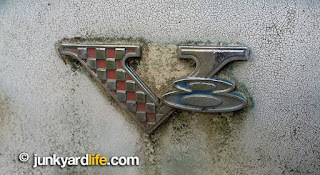 The guy who basically penned the iconic 1968 GTO and the second generation Firebirds/Trans Ams that we are addicted to? That, sir, is a solid “Yes”. There was not enough yes-ness in the word “yes” to express the yes value of our yes. We had to get to Louisville, no matter what. Junkyard Life was invited to lunch with Pontiac designers, Bill Porter and David McIntosh. 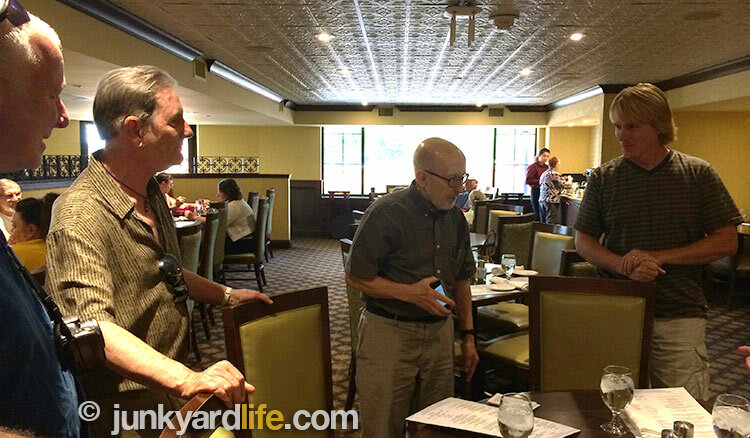 From left, Ron Kidd, David McIntosh, Bill Porter, and Anthony Powell discuss all things Pontiac. We arrived in Louisville without trouble, other than my driveway full of premium fuel back in Alabama. I would say that we walked directly into the hotel restaurant and Scott introduced us to Bill Porter. That sounds too easy, but it was exactly that. A very nice gentleman extended his hand, and said, “Hi, I’m Bill.” He was a humble, soft spoken man who spoke with us as equals. Hopefully, we appeared to be friends, and fellow enthusiast, not the giggling school girls that we felt like. During lunch with Bill Porter, we were introduced to former Pontiac/GM senior designer, David McIntosh, who was instrumental in the development of the 1978 Grand Prix. To top it off, noted Pontiac Trans Am collector, and owner of more than 80 running T/As, Steve Hamilton, also shared our table for lunch. 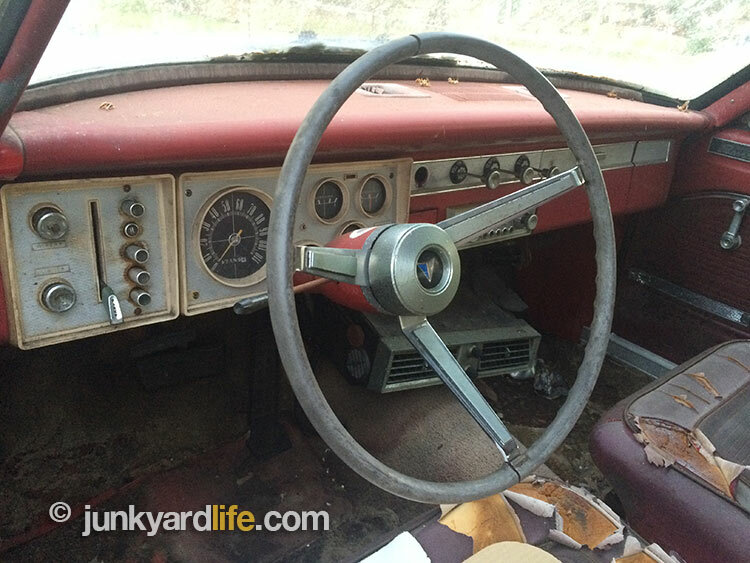 The planning wheels were already in motion for a trip to visit his collection in Indiana. We all ate and talked Pontiacs. It was a perfect trip and this was just the first hour after we arrived at the POCI show. Scott’s mother and Grandmother were also at the lunch. They signed papers to adopt us, then on we went to Bill Porter’s presentation as one big, happy, Pontiac family. Bill Porter, automotive designer with GM, was instrumental in the development of the 1968 Pontiac GTO and 1970 Pontiac Firebird Trans Am. Bill Porter’s detailed presentation was full of great Pontiac memories and facts. We learned a lot and the whole day just seemed surreal. It felt like we just walked into Pontiac Studios and were a part of history. 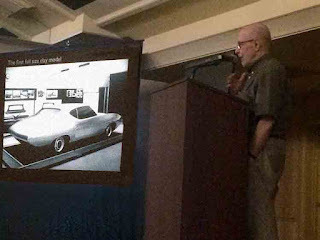 Bill Porter, former Chief of GM’s Advanced Design Studio, covered his design career and the many high profile, working relationships, which included Harley Earl, Bill Mitchell and John DeLorean. Quote of the day, from Porter to us, “Thank you guys for taking care of my cadavers.” After speaking to a throng of POCI attendees, Porter signed some of my Pontiac advertising. My walls at home will be a little more special with those framed mementos. Thank you, Bill. We will never forget that day. Ron Kidd is all smiles as he poses with his autographed 1968 Pontiac advertisement, courtesy of Bill Porter. 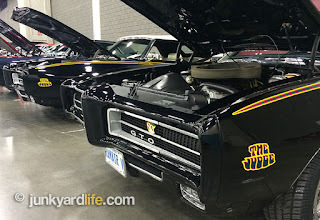 High octane fun continued outside the POCI convention hotel, as we strolled among several Safari Wagons, GTOs, Firebirds, Grand Prixs, Grandville’s, LeMans, and so much more. There was also a Pontiac swap meet, and this was only the first day. What else can compare to this? 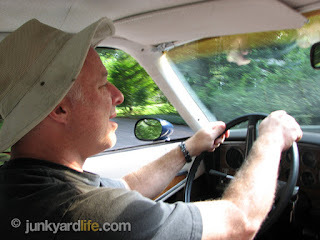 Ron Kidd behind the wheel of a 1973 Pontiac Firebird Formula. 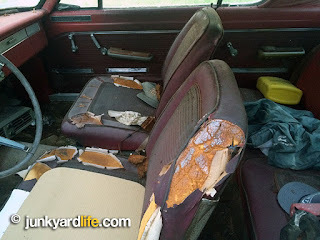 Remember the mention of my bad luck resulting in my not driving my 1973 Grand Prix? Well, that night our brother, Scott Scheel, shows up for dinner in a beautiful, Admiralty Blue 1973 Firebird Formula. Scott felt bad that my ’73 didn’t make the trip, so he offered, almost insisted, that “The Admiral” be my mode of transportation for the next 24 hours. I wondered how he managed that, because he drove to Louisville from his home in Indianapolis in a beautiful 1974 Grand Prix SJ. 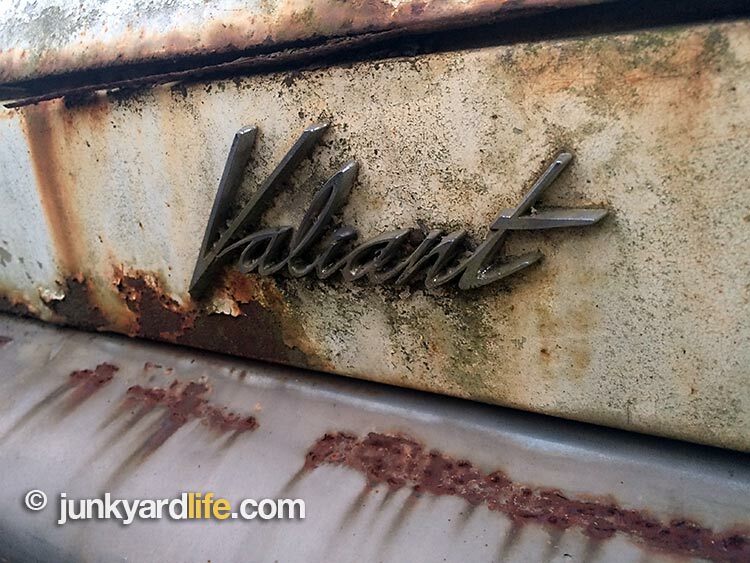 It was hard to drive a classic Formula and feel bad that my Grand Prix didn’t make it. I survived! 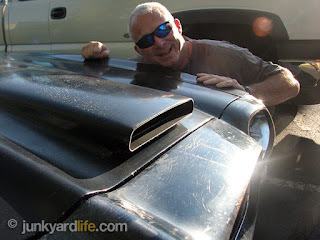 Bill Porter knew that functional twin scoops, used on the Formula hood, were proven to work, and better suited to the Trans Am, instead of the backward-facing shaker hood scoop that Pontiac used on the T/As. 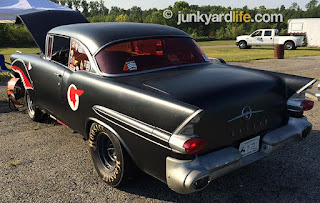 I don’t even remember which night we went to the Ohio Valley Dragway and enjoyed a night of racing. There were a few different classes. The staging lanes were heavy on Pontiacs due to the POCI show. I prefer heads-up to anything. It must have been the first night, because a local racer, driving a 1973 LeMans, noticed that we were with the large Pontiac contingent. He told us about a 1977 Grand Prix in a salvage yard back in Louisville. Naturally, that was our first stop the next day. Pontiacs could be found all over Kentucky, including the nearest drag strip, during the 2015 POCI show. 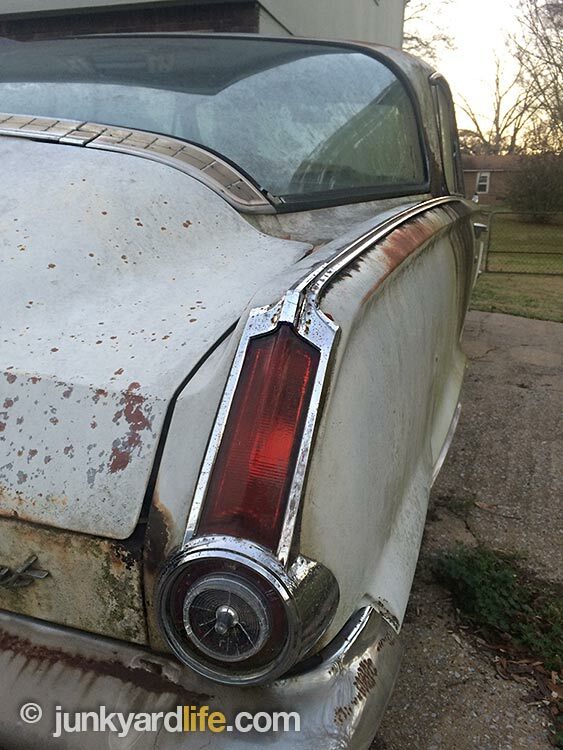 This 1957 Chieftain gasser carries the Pontiac banner proudly. Pontiacs racing, 30 miles south of the POCI show in Louisville, at the Ohio Valley Dragway. 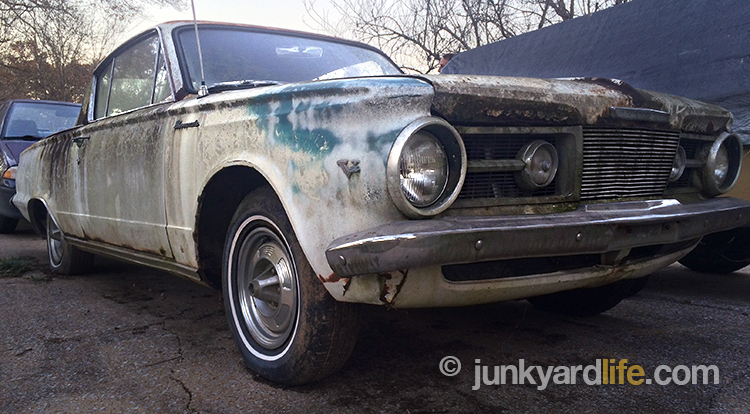 The ’57 Poncho bests the ’67 Firebird at the line. 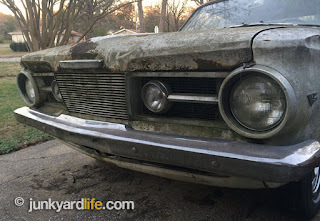 Day two began when the salvage yard opened. 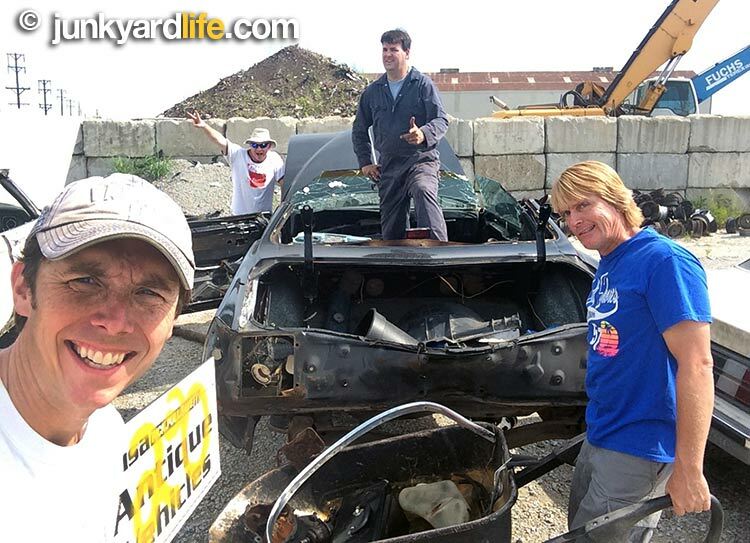 The Junkyard Life crew, consisting of Anthony, Scott, Jody, and myself, had a Grand time. So to speak. Scott actually went home with some of that Grand time. The Starlight Black ’77 GP had a few parts that Scott couldn’t leave without. Junkyard Life in our best "Grease" pose. Left to right, Jody Potter, Ron Kidd (waving), Scott Scheel, and Anthony Powell. 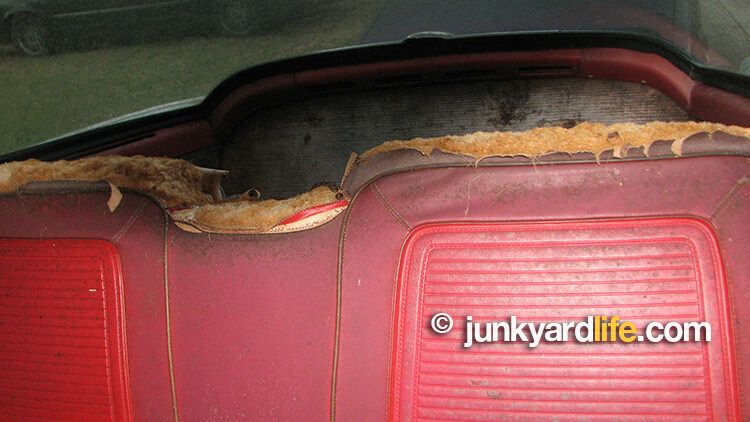 The 1977 Pontiac Grand Prix donated its roof to a recent parts puller. The SRI yard had several older vehicles in stock. After a 2-hour junkyard jaunt, the crew zipped back to the hotel for the Grand Prix Chapter of Pontiac Oakland Club meeting. A meeting sounds boring, but they were talking about Grand Prixs and road trips. I actually became a club member and look forward to hanging with these guys in the future. We joined them for “The Road Warrior” cruise with several Pontiacs to Claudia Sanders Dinner House in Shelbyville, Kentucky. Founded by Colonel Harland Sander, of KFC fame, and his wife, the beautiful, equestrian-themed restaurant has wonderful food in a southern setting. 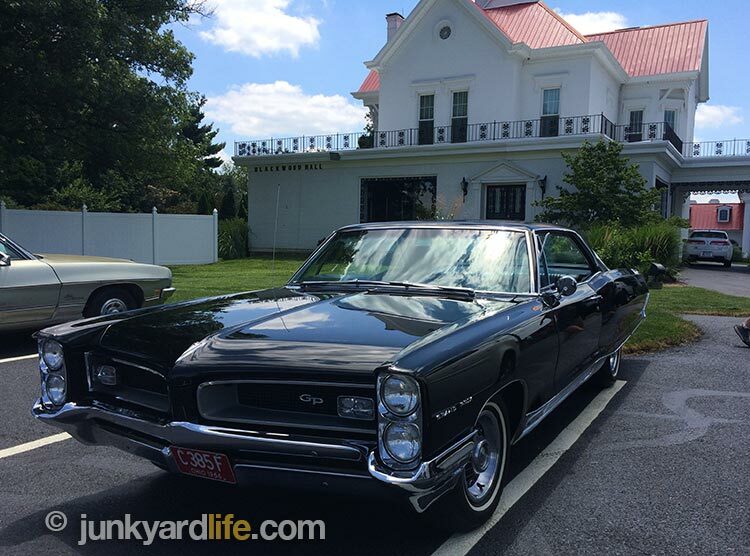 A 1966 Pontiac Grand Prix, part of the POCI Road Warriors cruise, found a parking spot in front of Claudia Sanders Dinner House in Shelbyville, Kentucky. 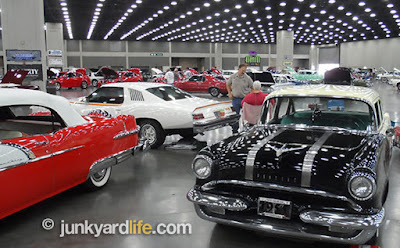 Day three found us at the Kentucky Exposition Center knee deep in nice Pontiacs. The cars did not disappoint. 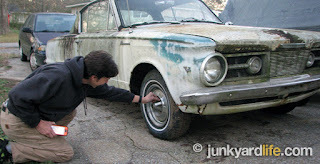 Incredible survivors and concours restorations covered the place. Rare combos and every Pontiac imaginable was represented. Our cameras were on overload. I heard some complaints that the lighting was “too good,” or perhaps created a reflective state that made it difficult to photograph cars without spots. I loved it. 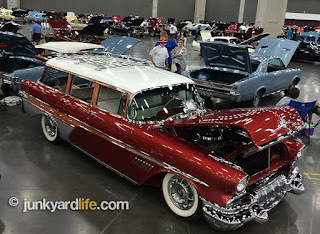 It created an “autorama” effect in our photos that I appreciated. Day three only got better. It was time to head home, right? 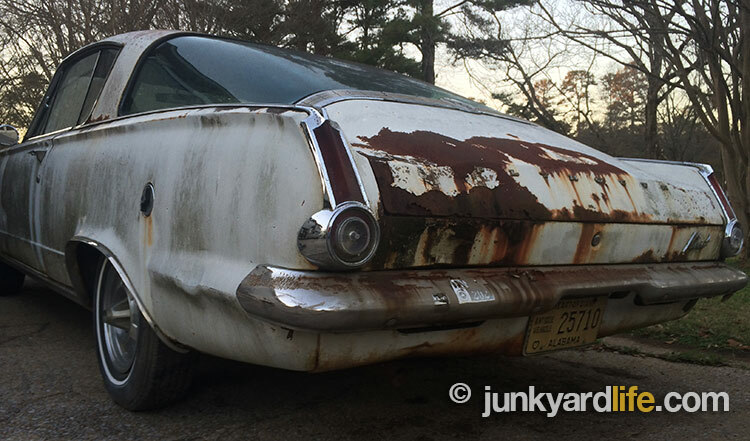 Or… or, we could go further north into Indiana for more Pontiac fun? Big Pontiacs, small Pontiacs and everything in between could be found at the 2015 POCI show in Louisville. Above, a 1957 Pontiac wagon commands attention. Two 1969 Pontiac GTO Judge convertibles, both in black. One features a white top, the other a black top. 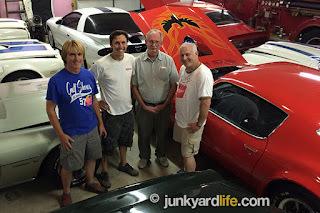 Thanks to Scott Scheel, Junkyard Life was invited to tour the Steve Hamilton’s private Firebird/Trans Am collection. Since I was the stowaway without wheels in Louisville, I got to ride with Scott in one of my dream cars… his 1974 Grand Prix SJ with a 455 and a tachometer. Good stuff. Steve Hamilton got bit by a Bird a long time ago, and he never got over it. He has the largest Bird’s nest we have ever seen. We all own Firebirds. We all own more than one Bird. But, if you put all of our Birds together, it would not amount to a fraction of this collection. Despite our drooling problems, Hamilton let our motley crew into his Bird’s nest with cameras. I can’t begin to describe the next two hours. Formulas, Trans Ams, Birds with birds on the hood, Birds without birds on their hood, 4-speeds, 5-speeds, 6-speeds, Super Duties. All our favorite editions, Honeycombs , Snowflakes, they were all present. We really couldn’t believe our eyes. Steve Hamilton, third from right, has a very large collection of running Pontiac Trans Ams, possibly the largest in the world. Hamilton graciously gave us a first-class tour. Details will soon be featured on the site. 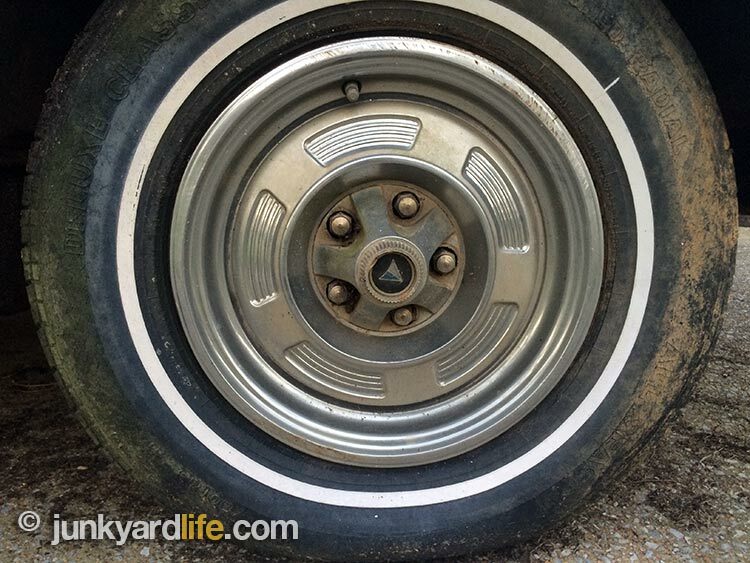 As luck would have it, Jody is debating what color combo to go with on his 1970 Formula 400, and this Firebird overload didn’t help. He wanted them all. Imagine mentioning a color combination and Mr. Hamilton pointing to one. I am experiencing some degree of writer’s block trying to even tell you my favorite. That is impossible. I would have to go top ten. Only, that is impossible too. I have a poster of the 1976 Goldenrod Yellow Formula advertisement. Hamilton had an actual ’76 W-50 Formula in yellow. He wins! This was yet another experience that we will never forget. A heartfelt “Thank You” goes out, from us, to Mr. Hamilton. We regained our composure enough after the Trans Am tour to realize that we had pushed dinner late into in the evening. We were lucky to find a restaurant still open, and lucky that Mr. Hamilton joined us for more Pontiac conversation. A great time indeed! Junkyard brothers unite in Louisville at the pull-your-own parts yard. Powell, Kidd, Scheel, and Potter. Day three ended at Scott’s house where we partied as much as four exhausted Pontiac nuts could. I slept in a room with over 2000 LP records. Beneath me was Scott’s vast Pontiac collection. 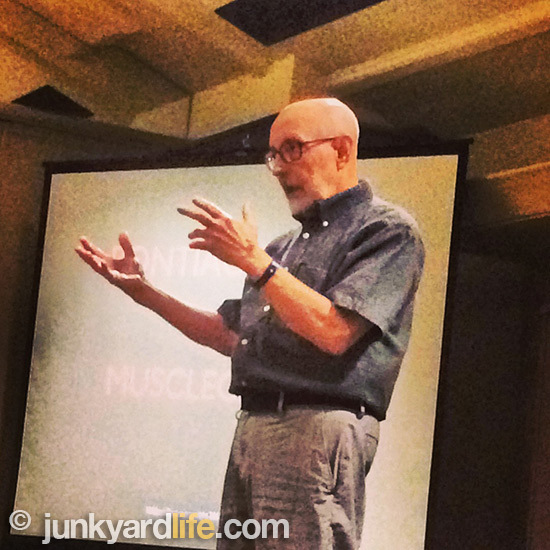 It was Ron Kidd overload. I wondered if I had died, and if this is what Heaven would be like? The next day we headed back to Alabama wondering if we just dreamed that whole weekend? Thank you, Scott. We had a great time and look forward to next year. We double dog dare you to try to top that! 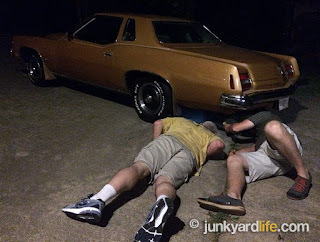 Former GM designer, David McIntosh, left, gets a closer look at Anthony Powell’s 1979 Grand Prix. McIntosh’s designs were featured on the Grand Prix redesign in 1978. 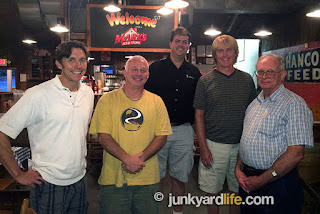 POCI road trip characters grabbing BBQ in Louisville at Mark’s Feed Store Bar-B-Q. (left-to-right) Potter, Kidd, Scheel, Powell, and Hamilton. 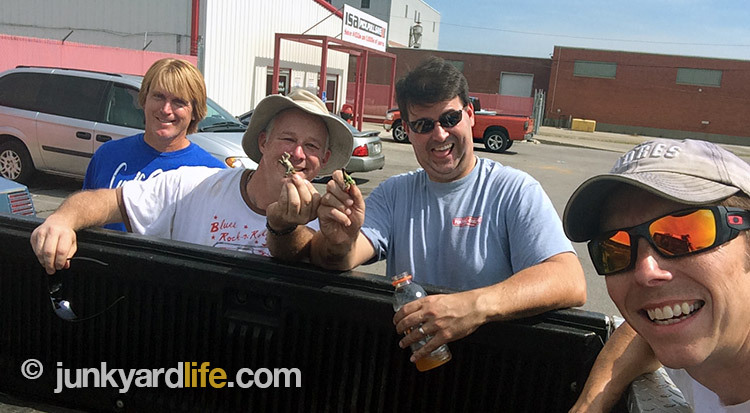 The 2015 POCI show road trip wouldn’t have been the same without the camaraderie of junkyard friends. Get out there, enjoy, and do something!